Thank you to all who supported the NSP Annual Fundraiser! It was a great success. Thank you to Jake's Grill and Oyster House for hosting the event! You may continue to donate here! For any donations you make, you will receive a tax receipt by email. Three New Projects are Underway! NSP is about to start 3 new projects: a primary school in the Banakhu area, a toilet construction project and a water installation project in Phoksingtar! School Construction Underway in Thulo Baspur! Check out our slide show that showcases Nepal School Project Board Members and villagers hard at work building our very first earthquake resistant school! Aeroplan Pooling Program-Donate Your Aeroplan Miles to NSP Today! NSP is now accepting Aeroplan Miles for donations! Donate NOW! Aeroplan's Charitable Pooling Program focuses on supporting organizations and individuals who want to improve the lives of people in their local communities. Your Aeroplan Miles will aid NSP in travel, car rental, hotel stays and merchandise. The donated Aeroplan Miles may also be used as prizes for fundraising. In some cases, community members may also use this pooling option to help an individual in dire need of assistance for medical purposes or a family emergency. NSP is fuelled by our relationship with our Board in Nepal and our ability to respond to crisis in our villages. To do our job well we need to be on the ground in Nepal as much as possible, collaborating on projects and building capacity. Your Aeroplan Miles would go a long way in helping us to meet our goals. To donate click here! Since receiving word that 90% of our schools were destroyed by the earthquake, NSP's focus is infrastructure development. Your donation will go directly toward the re-building of much needed schools in the Kaavre district! Our plan is to not only support the re-building of schools, but to research development plans that would protect future buildings from being so drastically impacted by natural disasters, such as earthquakes. This will help to ensure all funds raised now support the long-term prosperity of NSP villages. Make your move today and be part of ensuring that all children in Nepal have access to an education! Donate here. Help create a better quality of life for vulnerable populations in rural Nepal by gaining their full participation in the development of projects targeting certain aspects of their communities such as health, sanitation, and education. Support communities in seeking solutions to problems they have identified and to provide materials and expertise in the completion of these identified projects. Raise and allocate funds for development projects in rural Nepal. The emphasis must be on "grassroots" projects that clearly benefit the needy and underprivileged people. Nepal School Projects was founded in 1974 to assist poor rural communities with the construction of schools. Since then, NSP has evolved to support and empower Nepal communities with developing their own resources. What is Nepal School Projects? NSP (Canada) was founded in 1974 for the purpose to assist poor rural Tamang communities of Kabhre Palanchok district with schools construction. At that time, villages seeking education for their children first had to construct suitable premises with their own resources in order to be eligible for government appointed and paid teachers. Thus, very poor villages with no resources that were unable to construct such premises were at a disadvantage. 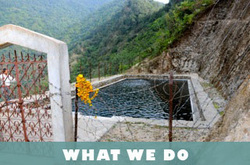 During NSP’s first ten years in Nepal, the organization assisted 56 villages with the construction of primary schools. In addition to the construction of schools a hands-on vocational training program for young village adults was established. In the fall of 1984, after meeting the educational needs of the poor rural communities in the central and northern parts of the district, NSP made an exploratory visit to the southern Mahabharat region. This region was officially considered to be a remote undeveloped area of the district - the visit was a revelation. The villages that were visited were the poorest ever encountered during NSP’s presence in Nepal. During the fall of 1985 NSP shifted development assistance to the southern Mahabharat region. Although the initial objective was to provide assistance with school construction, NSP was receiving a large number of applications for assistance with drinking water systems. Therefore, within two years of NSP presence within the region, assistance with drinking water systems became the key development focus. Today, NSP has broadened its focus further by responding to a wide range of community identified needs. Any community seeking NSP assistance must form a project committee with full participation of women that will be responsible for project formulation and implementation.